Claver, Surigao del Norte in the Caraga Region is one of the places to have the biggest iron mineral deposit throughout Asia and has attracted many mining companies. It has at least three (3) mining companies of which Nickel is one of the main heavy metals being mined-out. Adnama Mining Resources Incorporated (AMRI) is one of the companies established in the area which is engaged in Nickel mining. There were several heavy metals hyperaccumulator plant species already identified (Fernando et al., 2014) and reported worldwide by scientists in several countries. The application of this remediation strategy (using these identified plant species) however, is limited by the climactic and geological conditions of the site to be remediated such as the temperature, soil type, and altitude; it is further limited by the availability of the metals in the soil for uptake (Schmoger et al., 2000). Hence, this study has been conducted to provide insight for the rehabilitation of the mined-out areas of AMRI. 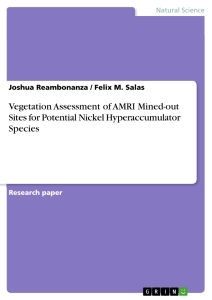 The primary objective of the study was to identify potential nickel hyperaccumulator native plant species that can be used as a tool for soil remediation in mined-out areas of Adnama Mining Resources Incorporated (AMRI) located at Brgy. Urbiztondo, Claver, Surigao del Norte, Philippines. Specifically it aimed to (1) assess the biophysical characteristics of the mined-out areas of AMRI with special reference on Nickel, (2) evaluate the nickel content of tissue samples of selected native plant species as potential Ni hyperaccumulator and (3) recommend native plant species suitable for restoration of mined-out areas operated by AMRI. Samples of soil and plant species were collected from the mined-out areas of AMRI at Brgy. Urbiztondo, Claver, Surigao del Norte, Philippines. After field surveys and visual observations, four (4) sampling sites were identified. Three of these sampling sites were in the mined out areas still having natural vegetation while one sampling site was in the area that was not yet mined during the conduct of the study which served as a reference. The sampling sites were established in the mined-out areas where natural vegetation is still present. Sampling area was divided into four sampling stations each with 10 x 10 meters. Topographical locations of the established sampling sites are modeled in Figure 1a and Figure 1b. First sampling site was established at the summit of the mined-out area, second was established at the backslope, and the third was established at the footslope. The fourth sampling site was established at backslope in an area which was not mined-out a few kilometers from the three (3) sampling sites. Established sampling sites 1, 2, and 3 are located at Block 2 Mined-out Area of AMRI while sampling site 4 was established at Block 3 of AMRI. Four composite soil samples in four different strata (0-20, 20-40, 40-60, 60-100 cm depth) at each established site were collected and placed separately in properly labeled plastic bags. Soil samples were subjected to standard methods and procedures of soil sample preparation of the AMRI Assay Laboratory. After the preparation of the collected soil samples, it was then subjected to XRF method of analysis for total Ni analysis. Standard methods and procedures of the AMRI Assay Laboratory were followed for total nickel analysis. Healthy mature leaves of indigenous plants that were covered by the 10x10m established sampling site at each site were randomly collected. Leaf samples were taken from 5 different plants of the same species per sampling point to make a composite sample. In cases where the population of one species of plant was less than 5 in the sampling site, a composite sample was collected from the maximum number of plants present. Leaf samples were washed with distilled water in the field, air dried, kept inside labeled paper bags and was transported to the Department of Agronomy and Soil Science, Visayas State University. Samples were oven-dried at 70°C for at least 2 days before grounded and placed in labeled small paper bags. Grounded leaf samples were screened (semi-quantitative test) for nickel accumulation. A 0.5 g of each grounded plant sample was wet digested with 6 M hydrochloric acid overnight. The digest were diluted to 100mL volume solution. Aliquots were taken and added with 1mL of 1% dimethylglyoxime dissolved in 95% ethanol. Formation of pink or magenta color indicated exceptionally high (above 1,000 μg g-1) concentration of Ni in the dry plant matter (Fernando et al., 2014). Standard nickel previously added with 1 % dimethylglyoxime, dissolved in 95% ethanol was set-up for UV-Vis analysis. The wavelength of this sample served as the basis in qualitatively determining the plant samples for possible nickel hyperaccumulation. The top ten (10) samples were then analyzed quantitatively for total nickel concentration using the UV-Vis Absorption Spectroscopy. Kept, grounded samples of these top ten were ashed at 600°C for 2 hours followed by the addition of 1mL concentrated hydrochloric acid. The digests were diluted and aliquots were taken then 1mL of 1% of the nickel-specific colorimetric reagent, dimethylglyoxime, dissolved in 95% ethanol was added. After which, samples were taken for nickel analysis through UV-Vis Absorption Spectroscopy. Standard methods and procedures were adapted from Salas et al., (1998). Levels of μg g-1 of Ni in leaf samples were compared to the criteria for classifying metal hyperaccumulator plant species. To be considered hyperaccumulating, the plants must have accumulated 1000 mg/kg or 1000 μg g-1 (dry weight) or 100-fold greater than in those common nonaccumulator plants of Ni (Shaw, 1989; Baker, 1995; Salt et al., 1995; Lasat, 2002; Baker and Brooks, 1989). Soil and Plant sample’s Ni analysis results were subjected to statistical analysis (ANOVA) using STATISTICA software version 8.0.